Invoked Mechaba is the best Invoked monster and a reason why the deck got to where it was. Easy to summon within its own deck, strong ATK/DEF, Mecharba is a boss monster that controls your opponents hand. A potential negating effect during either players turn, Mecharba is a great 1-for-1. As long as you have a card in the hand, you had the ability to negate something. The banish effect of the card Mecharba negates is an added wrinkle for your opponent. While losing a spell/trap may not hurt them, losing a monster could seriously hamper their strategy. Once per turn is a good way to manage this cards power, and its only made in their achetype (unless made by Waking the Dragon). Invoked Mechaba is a great monster and is incredibly popular. It’s a Level 9 Light Machine-type Fusion Monster with 2500 Atk and 2100 Def. It requires Aleister and any Light monster to be properly Fusioned Summoned, but the effects just need Mechaba to be on the field. That effect is a quick once per turn negation of any card type and then banish the non-targeted card. It costs a discard from the hand of whatever you are trying to negate. I wish the effect was not once per turn, but it’s still amazing disruption during either player’s turn. It’s also easy to summon within its own engine. Mechaba is worthy of a high score for being splashable with current support and relevant in a format that needs strong fusions to compete with Link Spam. We end this week off with without a doubt the best Invoked Fusion there is, Invoked Mechaba. Mechaba is a Level 9 LIGHT Machine Fusion with 2500 ATK and 2100 DEF and requires Aliester the Invoker and any LIGHT Monster. The materials to summon are easy as Aliester is searchable off Magical Meltdown, which is searchable off Terraforming/Metaverse/etc. LIGHT is also a common attribute in many decks, so playing the Invoked engine means you are playing this, since said Invoked engine is mostly splashed into decks with many LIGHT Monsters. LIGHT and Machine are a great Attribute/Type combination, and I can forgive the stats on a Level 9 since you are probably not giving up something too strong for this, or maybe your opponent’s LIGHT monster, plus the Invocation you likely use will banish the Aliester you likely use, meaning you can put the Invocation in the deck and Aliester in your hand to discard and make Mechaba 3500 ATK at any given point. Once per turn, as a Quick Effect, if a Spell/Trap Card or Monster Effect is activated, you can discard a card of the same type (Monster, Spell, Trap) to negate and banish the activated card. That is all Mechaba really does and that is all it needs to do. Negation in any form is typically great unless the cost is absurd, and banishing is one of the best forms of removal. Mechaba was so good in the OCG that they first limited Aliester the Invoker to 1, but when that didn’t solve the problem, they moved Alister to 2 and put Mechaba to 1 so you don’t have to deal with multiples in a duel, and if the Invoked engine ends up being as popular in the TCG as it was in the OCG, I can see Mechaba seeing the same fate over here. Man, what is it with the archetypes having their Fusions hit when they work with LIGHT Monsters? I guess LIGHT is really that good of an Attribute, just as Mechaba here and Construct. Back to the point, Mechaba is again the best Invoked Fusion and you are likely playing the Invoked Engine because of this. Art: 4.25/5 I can buy that being a Machine, looks like some sort of chariot. 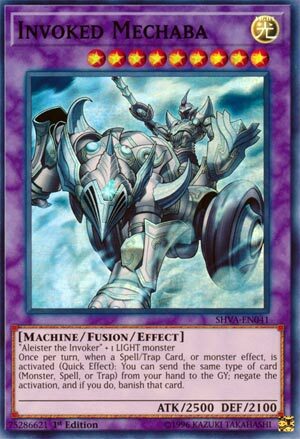 Closing the week is Invoked Mechaba (this is a special time too where a card is in a different status in the OCG than here, and usually it’s just a spot) but here, this card is Limited in the OCG and Unlimited here in the TCG. This is a Level 9 (9?) Fusion, Light attributed, 2500 attack and 2100 defense (Dark Magician stats!) which are poor on a Monster with a higher Level. Fusion Summon here with Aleister the Invoker…(which we also haven’t reviewed, but here is a link to that card, which is also Semi-Restricted OCG and Unrestricted TCG). …and one generic Light Monster. But, you see in the effect, that the lower attack (not that 2500 attack is something to sneer at) isn’t such a hinderance after all. As a quick effect, once a turn, when a Monster/Magic/Trap effect is activated, you can send the same type of card to the Graveyard to negate the activation (and if you do so, you remove the card in question from play). This is good, on a couple of levels. I know things like Dark Paladin aren’t the best despite being GOOD because of things like discarding for effects. A discard effect can be played around by purposely playing things your opponent either wants or doesn’t care if you negate, and that too, brings the once per turn part into play. But fueling these cards (of various types to your Graveyard) can also help and assist numerous Decks. Requiring the specific Monster for half of the Fusion, this is hard to play, if at all, outside the theme. But the payoff here is big, and negation is good, so I’m a fan of what’s going on here.